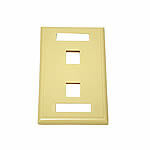 Our flush-mount keystone wall plates will fulfill the most complicated station installation requirements. 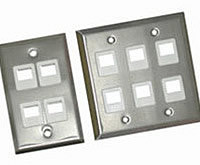 A variety of jacks and connectors will fill the wall plate openings. Since the inserts are a snap to install and remove, you can have a highly adaptable and professional-looking cabling system. 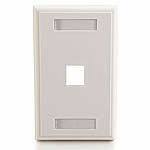 Plus, we provide write-on designation labels with holders for easy identification among different systems or stations.Compatible with NEMA standard openings and boxes, this wall plate will mount to any electrical or surface mount box, and work with any keystone jacks or keystone inserts. Designed for ethernet networking, data, voice, audio/video, fiber optic, and other applications. 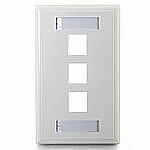 Provides a professional appearance for network and multimedia installations in commercial and institutional environments. 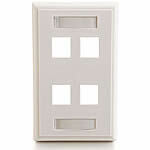 A variety of jacks and connectors will fill the wall plate openings to meet your specific requirements for voice, data, audio, video, fiber optic, etc. 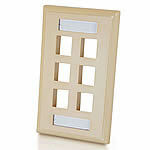 The inserts are a snap to install and remove, so that you can enjoy a highly adaptable system.